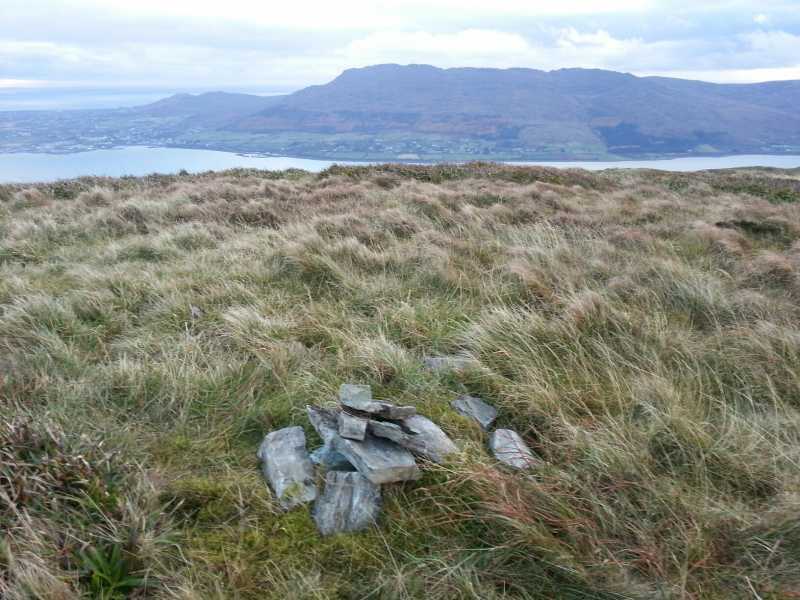 Slievemeen is the 652nd highest place in Ireland. Slievemeen is the second most southerly summit in the Mourne Mountains area. If you want to do a more lengthy walk than the routes already described, I can recommend a great walk that I took on the bank holiday Monday. The route starts at only 18M above sea level, is approximately 4km in length to the summit and took me 1.5 hours to reach the top. I had planned out a 13km circuit over Slievemeen, Slievemartin and Crenville as being a perfect walk for a long summer evening. Having never got around to doing this, I was glad to try it on an autumnal afternoon to burn off some of the excesses of the weekend! Once I got to the forest tracks on the far side of Crenville before the sun fully set I didn’t mind doing the last stretch in the dark. As you turn off the coast road at the signs for Kilbroney Park you will see a parking area past a red brick building on your right. Park up here and walk back down the road a few metres to the opening of the track at J 19792 18349 D. This walk takes you into a nature reserve and it starts of as a beautiful mixed forest walk. You simply follow the way markings to the Fiddlers Green, heading through the green you take a left at the junction in the track. From here you are looking out for a waymarking that says “viewpoint” which is at J 18800 17265 E, follow a steeper track through the trees. You keep following your nose up to the Cloghmore which is at J 19154 17257 F.
As the walk gets closer to the big stone the trees start to fall away and views start to open up, not just back down to the Lough below, but even over towards Slievemartin which would be a future target. From Cloghmore you follow the tracks to the obvious opening in the forest to the south east. Your next target is the old stone wall over Ballymagelty at J 193 169 G, it is near the corner of the forest on your right hand side. The route to the top is as simple as following this battered old wall. Again your surroundings change on this last stretch of the walk, as the more exposed mountainside gives new views of the Lough and right down to Binnian and Lamagan as you rise further up. The summit is marked by a modest pile of stones a few metres away from the wall. The variety of scenery and views on this route make it one that I would recommend. You also get to walk pretty much the full ascent of the mountain (you can start from the Lough if wish to get it all though). The Clogmore is an area that should be part of your ascent of this hill anyway, whatever route you choose. Another beauty of this route is that you are not doubling back on yourself if you are heading for Slievemartin and further and it is all on decent track, but no road walking.